Japan logged a deficit on its trade account of 184 billion yen in Decmber, its sixth deficit in a row and seventh in the last eight months. 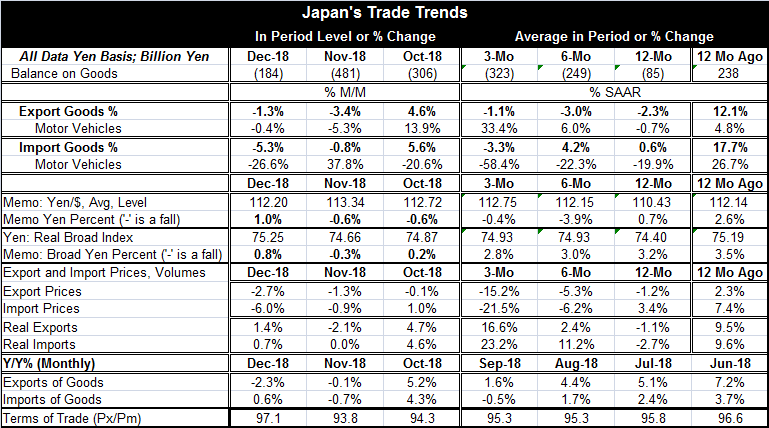 As the averages show, Japan's trade position has been in deficit over 12 months, over six months and over three months and the average deficit has been getting progressively larger. It has grown from 85 billion yen over 12 months to an average of 323 billion yen over three months. Even so, December's deficit is the smallest posted in the last five months. Japan's exports and imports each are falling for two months in a row. In December, exports fell by 1.3% and saw that drop exceeded by a 5.3% fall in imports. It is the relatively larger drop in imports that is responsible for the smaller deficit logged on the December trade account. Over 12 months, Japan's exports now are falling by 2.3%. Imports are up over 12 months but only by 0.6%. Over the past year, the yen has risen by a small amount vs. the dollar while the real broad yen exchange rate has been very stable as well and has risen slightly. Exchange rate changes are not a big part of the change in Japan's trade picture recently. Over the past year, Japan's export prices have been hammered lower. Japan's import prices are up by 3.4% over 12 months. Using these prices to adjust nominal yen trade flows and convert them to real flows changes the picture. Real exports rose in December, but that still did not offset their drop in November; thus, exports are still lower on balance over two months. Imports in real terms were flat in November and up by 0.7% in December, gaining slightly on balance over two months. Year-over-year both export and import volumes are lower with imports down by 2.7% and exports lower by 1.1%. Japan's trade flows clearly are slow-moving and the weaker import volumes over 12 months actually help to plow some growth back into the domestic economy. But that is a minor point. The main point is that the drop in imports tells us that domestic demand in Japan has been weak. Japan's largest trade partner is China with the U.S. in second place. China is slowing and some of the Chinese data have just begun to deteriorate sharply at the end of 2018. There could be more negative transmission to Japan. The BOJ has just met and is holding the line on policy. We are expecting the ECB to hold the line in its Thursday meeting. With Brexit uncertainty, and a real possibility of a jolting hard-Brexit, the BOE should hold the line as well. In the U.S., the Fed already has essentially said it was going to back off for a while. The IMF has cut its global growth forecast. China reported weak GDP for end-2018. The IMF in its outlook made some of its deepest cuts in the outlook for Germany and the EMU. Meanwhile, in the U.S., economic signals have not been clear and have run hot and cold where we have them at all. With some of the U.S. government shutdown, many U.S. reports are not even being issued. Global trade flows clearly are slowing. The U.S.-China trade unrest is a reason for a lot of it. There is a March deadline for getting a U.S.-China deal and some in the Trump Administration have issued optimistic statements about prospects for a deal ‘on-time.' But U.S. President Donald Trump has said that he will not water down his demands to make a deadline. The U.S. wants some real promises, some deliverable ‘nuts and bolts' promises and hard benchmarks for progress instead of vague and unenforceable statements of intent. There is still this issue of China seeking technological dominance by 2025 and its past willingness to steal or force technology transfer. This negotiating approach uses the same sort of framework that the U.S. has taken with North Korea where talks also are upcoming over nuclear disarmament. We see the same tactics playing out the President's stance on the wall (genuflect) he wants build on the U.S. southern border as he has taken a long government shutdown to try to get what he wants. Putting all this together, it seems reasonable to assume that Trump will be a serious negotiator with China and he will be seeking to get some real and significant changes from China. That means that, despite all the effusive optimism, the March deadline might not be met especially if China misreads Trump and thinks it can bully him into accepting a weak deal to meet the deadline. As I see things, that would be a mistake on China's part. But China also has been known to play hard ball so I'm not very convinced that we should treat this March ‘deadline' date as a likely for a deal despite all the rhetoric about it. Until we have a U.S.-China trade deal, expect China to continue to be under pressure and to try to prop up its fading growth rate. It will continue to try to pull domestic levers on debt issuance and fiscal policy to stave off weakness. Japan will continue to be caught in this crossfire.